Each report that you view will tell you how many responses are contributing to the data on-screen. Depending on how many responses are showing for the report, you can judge how reliable any trends may be. The higher the response count the stronger the inferences you can make. For more group specific response statistics, you can toggle over certain bars, lines or points. In your charts you may notice that a coloured bar is solid, but sitting on top of faded bar with the same colours. The solid bar represents the data you have applied with your filter set. The faded background bar is the overall ("National") data for your organisation. From the differences between the two, you can identify where your filtered data may be trending differently to your overall population. 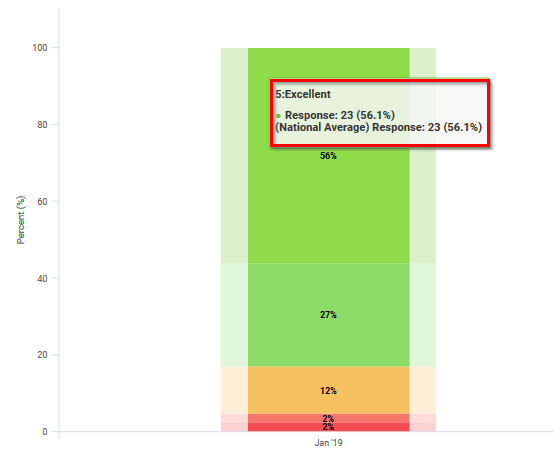 At the bottom of charts you will find a legend to guide you through the response options contained within the report. You can toggle which options you wish to view on your report by clicking on items in the legend. You can zoom into the data by highlighting the part you want to look closer at.